Maria (the host) was VERY helpful and nice, the villa has a nice garden, located in the forrest, but very close to the beaches and restaurants. Our friends had another apartment with a very lovely terrace. Overall, a very good experience for the money. Awesome spot and very tranquil and close to everything. Caretakers were incredibly nice. And owner Maria. Maria the owner was extremely helpful, she arranged our airport transfers both ways. she was always on call if we needed her. The apartments were lovely in a stunning location set back from the road in the national forest. I couldn't fault it. The property was perfect for little children. Easy entry exit from the room. very spacious. Fantastic garden for entertaining the most little one (I have 1 year old twins). Particularly appreciated the wood in the bathroom which is fantastic to avoid having dump feet all the time (which is a classic for greek bathrooms). Great communication from the housekeeper, we only stayed one night but wish it could have been longer. Lovely comfortable apartment with separate double bed upstairs and blocked in shower so no getting bathroom soaking wet! It`s really a nice location. We had an appartment with two sleeping rooms (parents, Kids), large living room, kitchen and bathroom. Everything very clean. We were searching for a location in Koukounaries because from there our favourite beaches (also in the North) are very close. Maria from Diadres is very nice! This is a lovely apartment with beautiful green gardens. A really nice place to stay with kids as it's safe, away from the main road, and has a kids play area. It's a short 5 minute walk through the 'bush' to get to the main shops, and then another 5 minutes to the beach. Maria was very welcoming, and we met some other lovely families there during our stay too! Very welcoming personnel, the host Maria was very nice. Very nicely designed apartment. Great yard with children playground; nice veranda cool even in hottest part of the day. Walking to the beach was possible without the car. Wonderful Apartment! You get what you see! Maria was very nice and helpful! She brought us from the busstop to the apartment, which is a short distance in the forest. Thank you! We loved the trees around us. We would recommend a vehicle for getting around on the island. The beaches in the north are amazing! Lock in a great price for Skiathos Driades – rated 9 by recent guests! Nestled in the evergreen Koukounaries forest, Skiathos Driades offers spacious, self-catering units with free Wi-Fi. It is only 1,300 feet from Koukounaries Beach and the marina, and has a garden with a children’s tree-house. The popular beaches of Banana and Maratha are a 5-minute drive away. Driades consists of a modern and a traditional building. Units feature flat-screen TVs, ironing facilities and a safe deposit box, as well as a fully equipped kitchenette with refrigerator and mini oven with hobs. 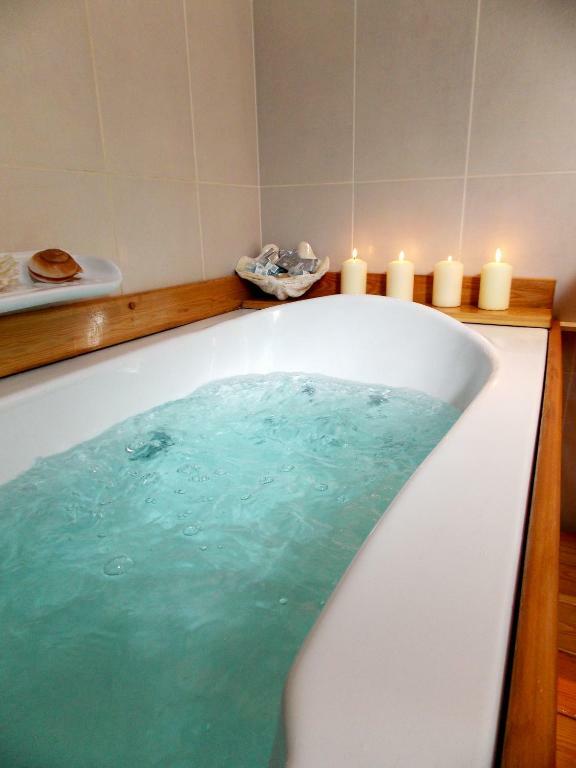 Some have a spa bath, while disabled-friendly rooms are also available. Free drinks and local products are offered upon guests' arrival. A super market, restaurants, and a medical clinic can be found only 350 feet from the property. Facilities include a table tennis and a children's playground, as well as a BBQ and a laundry room. Activities in the surrounding area include horse riding, scuba diving and water skiing. Guests can use the pool and tennis court of nearby property. The nearest bus station is 350 feet away and Strofilia Lagoon is 1,300 feet away. 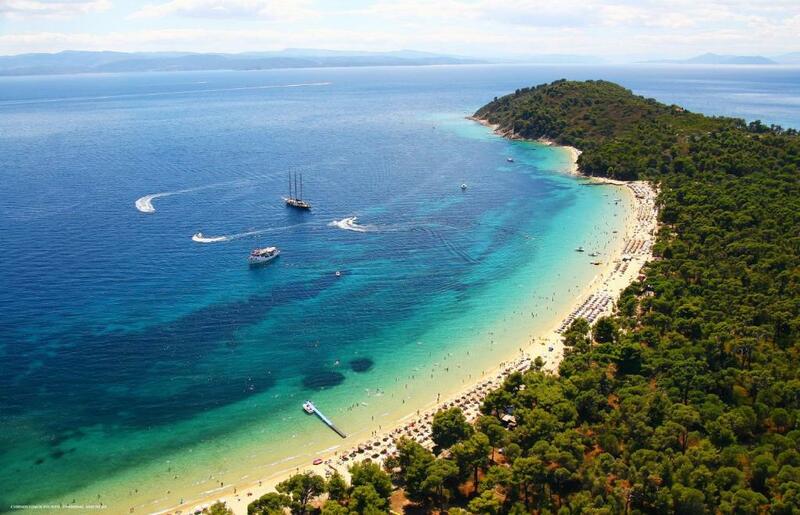 Skiathos Driades is 7.5 mi from Skiathos Town and port. Skiathos airport is 8.7 mi away. The beautiful beaches of Elias, Agia Eleni and Ambelakia are reached after a 5-minute drive. Free parking is available on site, and car, sailing boat and speed boat rental service is provided at the front desk. This property is also rated for the best value in Koukounaries! Guests are getting more for their money when compared to other properties in this city. 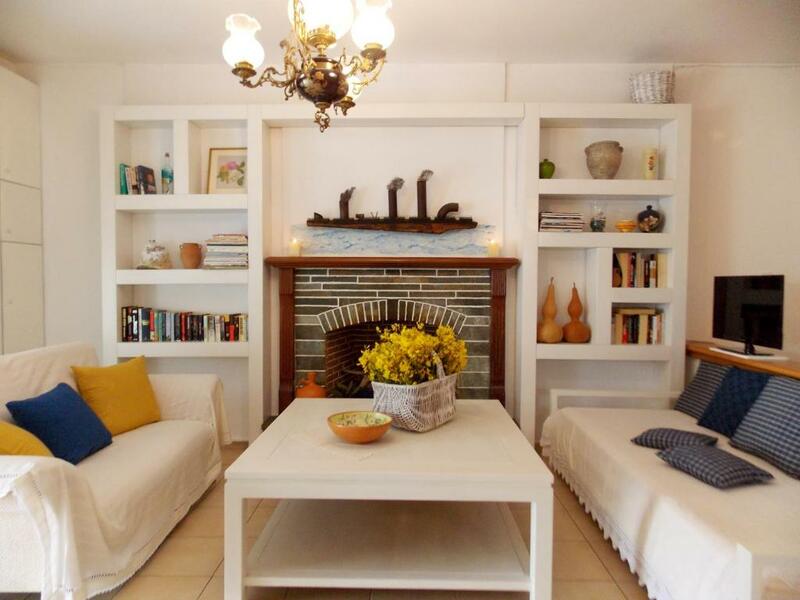 When would you like to stay at Skiathos Driades? Two-story apartment with a fully equipped kitchen and private, furnished balcony overlooking the garden and Koukounaries Forest. 2 flat-screen TVs are available. Spacious, self-catered room with modern spa bath in the bathroom. It includes a flat-screen TV, a furnished terrace and a small garden with trees. This split-level apartment, located on the first floor, opens out to a private balcony with garden views. Featuring a king-size bed on the 2nd level and a sofa bed converting to 2 single beds at the 1st level, the apartment comes with air-conditioning, 2 flat-screen TVs, and a well-equipped kitchenette. A spa bath and hairdryer are found in the private bathroom. Free Wi-Fi is available. This air-conditioned apartment, located on the ground floor, opens out to a terrace with garden views. Tastefully deocorated, it includes a seating area with a flat-screen TV and a well-equipped kitchenette. 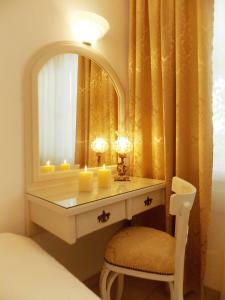 A spa bath and hairdryer are found in the private bathroom. Free Wi-Fi is available. It opens to a spacious, furnished terrace, next to the garden. Boasting a fireplace in the living room, this air-conditioned apartment, located on the ground floor, opens out to a furnished terrace with garden views. It includes a flat-screen TV and a well-equipped kitchen. Free Wi-Fi is available. It opens to a spacious, furnished terrace and 2 small gardens. This apartment offers a washing machine, indoor shading systems and 2 private parking areas. 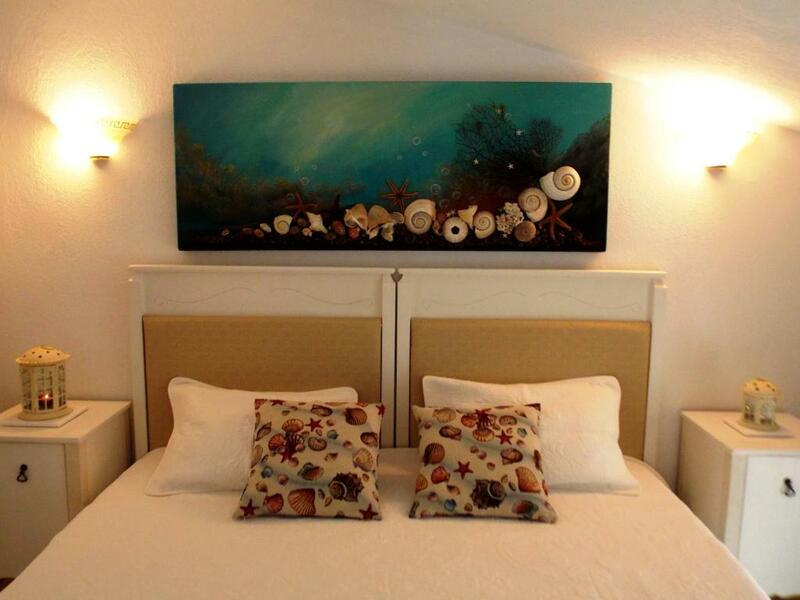 This traditional apartment features a fully equipped kitchen, a furnished terrace, a patio and a flat-screen TV. This traditional apartment features a fully equipped kitchen, a furnished terrace, a balcony and a flat-screen TV. 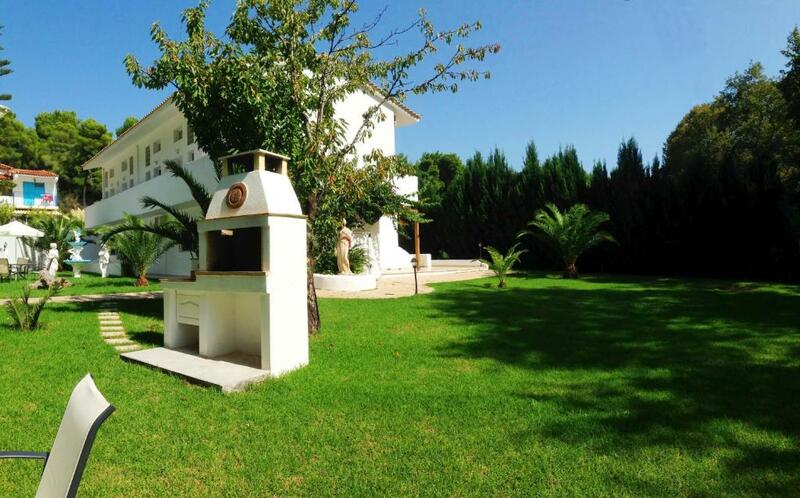 The villa consists of both modern and traditional buildings. 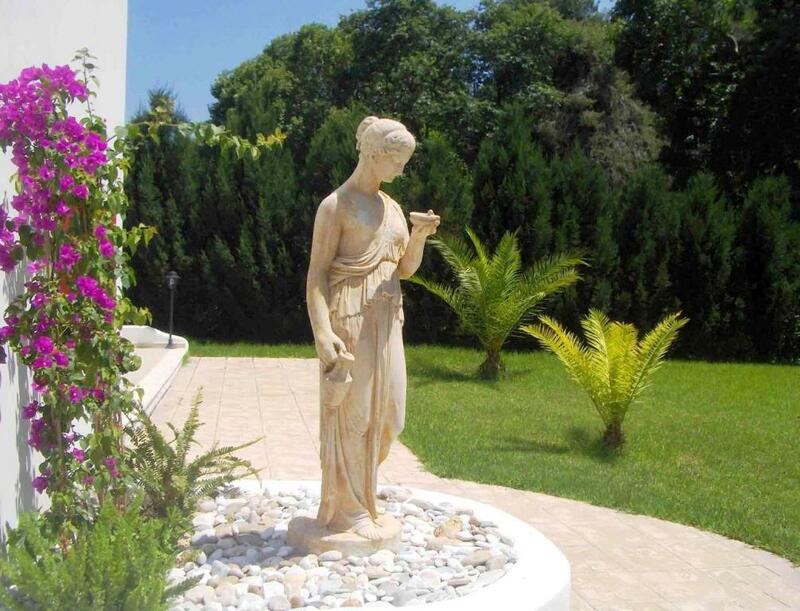 It’s furnished and fully equipped studios, maisonettes, apartments for rent are ideal for holiday-makers seeking relaxing and private family holidays. The hotel is working with ecological awareness and viewing to the designated Aesthetic Koukounaries Forest of pine and sycamore trees. 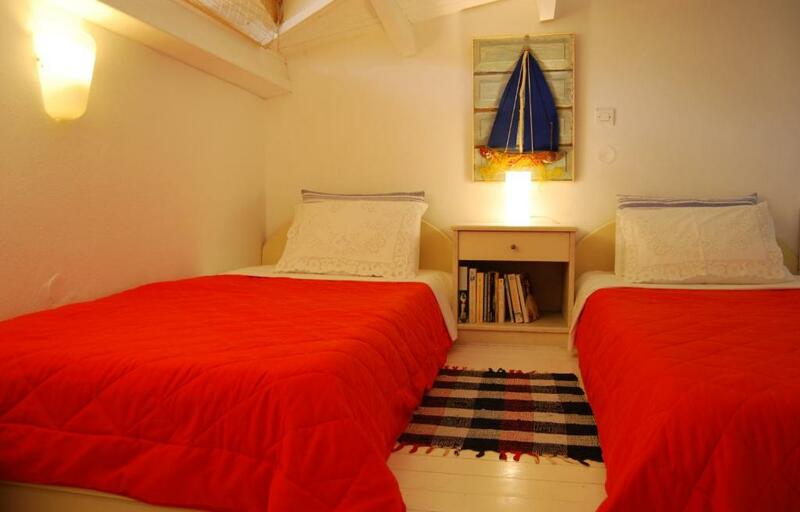 The guesthouse rooms for rent decorated with authentic artworks, are characterized by a combination of modern comfort and traditional element, offering customers an unforgettable, cosmopolitan and economic stay in Skiathos during their summer holidays in Greece. The ground floor apartments are ideal for guests with disabilities. The accommodation encircled by small gardens and a cozy one with a lawn, trees, statues, a fountain, garden furniture, a fully equipped barbeque, a big swing, a playground, a table tennis and a great - safe Treehouse to entertain young and older children. Skiathos Driades is situated into Koukounaries area, only 500 m. away from the organised and outstanding natural beauty beach of Koukounaries, with the blue flags, the golden sand and the crystal clear cerulean waters, equally exotic to Pacific Ocean. Primarily the love for the object of our job, as well as the experience, the reliability, the safety protection and the professionalism, is what characterizes us. Our main concern for our customers to have an enjoyable, unique and memorable holiday. We make sure they feel like their home, in a pleasant environment that prevails everywhere the cleanliness, and the beauty of fine art. Besides the welcome gifts, we provide customers with free information about the island and the individual events and we are available at any time to serve them in the best way. Also we demonstrate them how to reserve economic tickets and how to rent an economic and good car, without we get any charge. In case the customers are coming by car from Volos of from Athens we can inform them how to get cheeper ferry boat tickets for passengers and cars.. We co-operate with a Shipping Agency and we can get limited number of cheap tickets for each period for our customers. (We never take any kind of commission, as we are interesting to serve carefully our customers). We situate at the most beautiful, famous and interesting area in Skiathos island. Koukounaries with the unique pinno forests - the unique golden long beach equal exotic as those of the Pacific Ocean beaches - wich has been declared the third most beautiful beach in the Mediterranean. Koukounaries backs onto a pine forest reserve which offers shade, alternative activities or quiet time. House Rules Skiathos Driades takes special requests – add in the next step! Skiathos Driades accepts these cards and reserves the right to temporarily hold an amount prior to arrival. Kindly note that 1 child up to 2 years old can stay free of charge at a baby cot upon request and confirmation by the property. Please note that only pets of small size are allowed in the property. Please inform Skiathos Driades of your expected arrival time in advance. You can use the Special Requests box when booking, or contact the property directly using the contact details in your confirmation. Bathroom looks very nice, but it has some wooden floors and I think dirty water stays under the floors causing an umpleasant smell. This is something that must be fixed. Also, there should be a sign on the road pointing to the alley leading to the villa, we had troubles finding it in the first night. The tree house looks nice, but not sure if it's safe for kids. Downstairs bed was incredibly uncomfortable and hard and the WiFi signal was weak plus the TV battled to receive a signal the whole time we were there. Host nowhere to be found. Unclean premises (no vacuum cleaning, no towel or sheet changing). Road to the accomodation from the main street. Very nice, comfortable and practical maisonette with arty interior decorations (by the owner!) and very spacious terrace. Well located nearby a beautiful nature reserve and Banana beach. Kitchen is rather small but practically arranged. Location remote. Noisy kids booked next door. Dirty towels and like sandpaper. Terrible uncomfortable beds. Downstairs bed was a bit hard for me. Unfortunately the Wifi din't work very reliably.